Imagine our excitement—imagine!—when we read in the paper that “The Dying Gaul” was on view in DC!! This iconic sculpture, which is, in fact, a copy of an older work, has been the inspiration of countless artists in the last 2000 years. So we made plans for a long weekend, planning to see the Netherlandish, German and Dutch art at the National Gallery, which would complete our re-visit to the gallery since the 1970s. The intrepid Ron got us tickets to Mt. Vernon for our first day. We drove the 3 hours and arrived in time for the orientation film. This film is most excellently done and stars Sebastian LaRoche, who has appeared on General Hospital as the bad guy. He does an awfully good job as George Washington, aging. Thus fortified, we made our way to the mansion, stopping briefly to have my hands slobbered on by the Christmas camel, Aladdin. Mr. Washington had a camel brought to Mt. Vernon for a Christmas surprise for his family and it’s been a tradition since the mansion opened to the public. 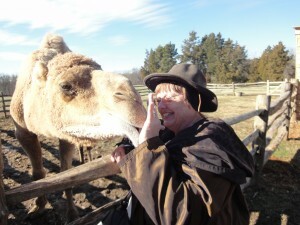 Camel spit is very slimy, but at least he didn’t spit in my face. I’m sure he smelt pye on my hands and thought I was a treat being offered. I wiped the goo on the grass and we went to get in line for our mansion tour. This time is set on the tickets, so there is not a mad crush at the doors, but a steady stream. Even so, we had a long wait in line, but took a bunch of photos and took turns wandering out of line to look at stuff. As I returned from one of these jaunts, a small V of geese passed over the mansion, honking, and I thought how some things never change. 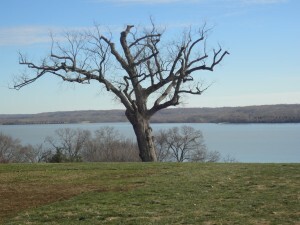 The Potomac view from George’s house is spectacular, with very little modernity intruding on the far side. His mansion and grounds are a super-sized version of mine home and creek, so I know how he cherished his time at his home, drinking in that view. At last, we entered the mansion. Here, we were quite amazed at how the people who had been waiting to get in hardly looked around when they crossed the threshold. It didn’t help that the staff was ignorant and that their spiel consisted of “move right along,” but we took our time to look into the rooms on either side of the entrance [the house is a glorified “dog-trot” house, with a hallway running straight through to the back, which provides a great breeze when the doors on each side are opened. The rooms lead off from either side of this breezeway / hall.] Some of the furnishings are original and some are apropos timeframe, much like in Williamsburg. The foundation has done a wonderful job of research and careful buying, but they do need to train the docents, imo. On the wall is the hulking iron key to the Bastille, the horrific fortress / prison that the Parisian rioters broke into to begin the French Revolution. The Marquis de Lafayette, Washington’s spiritual son, sent him the key as a way of saying the French Revolution would not have happened without the American first. Alas, theirs went horribly wrong, which points out the incredible Providence that made ours succeed. We went upstairs to view some of the many bedrooms, including the master suite and the small bedroom that Martha moved into after she was widowed. It fascinated me that the Washingtons entertained on a lavish scale, with dignitaries, friends and associates coming to stay, eat and drink for days if not weeks on end. All of this came out of their private funds, although such functions were at least partly on behalf of the government. The plantation was built to support this lifestyle, to provide meat, vegetables, flour, ale, whiskey and the like—everything but salt, which they had to import. Of course, enslaved people did the labor: spinning, weaving, furniture making, caring for the livestock, breeding the mules, brewing, baking, tanning, cleaning, sewing, plowing and harvesting. We learned when we visited the Great Dismal Swamp that Washington had invested in a canal through the swamp and sent gangs of slaves to dig the canal—a truly nasty job. But Washington was sensitive to the irony of winning freedom for the USA and denying it to many. His will manumitted his slaves upon the death of his wife. Mt. Vernon has many of the outbuildings fitted, including the overseer’s office, with a sleeping loft. 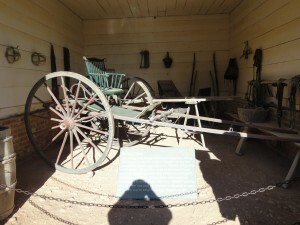 The carriages and kit in the stables are very interesting, although I the horses were on vacay somewhere, or maybe out in the fields. We visited the tombs of the Washingtons and a few of her descendants in a beautiful glade. The tomb itself is fairly modern, but tasteful. There is a massive museum under the grounds of the estate, which we breezed through, finding that our brains were pretty full. The best to me were the 3 forensic faces of GW at 3 stages of his life, including inauguration as president, set in vignettes. Ron: Carol still will not use that hand to eat.